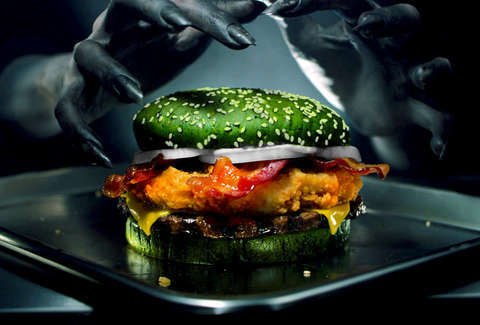 Capitalizing on Halloween tradition, Burger King is trying to drum up some business with their new “Nightmare King” burger. Their latest ad (watch here) highlights the quarter-pound beef, chicken fillet, cheese, bacon, mayo, and onion combination all on a green sesame seed bun. The ad claims Burger King partnered with the Florida Sleep & Neuro Diagnostic Services to conduct a clinical study designed to measure the burger’s ability to induce nightmares. Spoiler alert – their research claims nightmares increase by 3.5 times after eating the new burger. While the legitimacy of the claims is dubious at best, it is a good example of Burger King’s efforts to grab share in the overcrowded Quick Service Restaurant (QSR) market. This isn’t Burger King’s first seasonal stunt either. Three years ago they created a Whopper served on a jet black bun and last year they offered free Whoppers to customers who visited the restaurant dressed up as clowns. Burger King is also partnering with Postmates (a courier service who’s model is similar to Uber or Lyft) to offer free delivery of the new burger between October 22 and Nov. 1 suggesting an effort to push customers to mobile ordering. Read more about the campaign here.